Adapter design pattern in Java, also known as the Wrapper pattern is another very useful GOF pattern, which helps to bridge the gap between two classes in Java. As per the list of Gang of Four patterns, Adapter is a structural pattern, much like Proxy, Flyweight, Facade, and Decorator pattern in Java. As the name suggest, Adapter allows two classes of a different interface to work together, without changing any code on either side. You can view Adapter pattern is a central piece of the puzzle, which joins two pieces, which can not be directly joined because of different interfaces. I see a couple of reference of Adapter design pattern in one of my favorite book Clean Code, but the idea is very well explained in Head First Design Pattern, the image which they show to illustrate Adapter design pattern is worth all the talk. By the way, Adapters are everywhere in real life, most commonly when we talk about Adapter, we mean electrical adapters. If you have got an onsite opportunity and had visited US, UK or any other Europian or North American country, you might have seen different kinds of electrical socket than in India e.g. USA has a rectangular socket, as compared to cylindrical one from India. Basically, when we talk Electrical adapter, we talked about adapter which changes the voltage or the one's which allows using a plug designed for one country in a Socket of another country. This example shows an important attribute of Adapter design pattern in software development, you can neither change the Socket of visiting country, neither can change the plug of your laptop, So you introduce an Adapter, which makes things working without changing any party. Similarly, Adapter design pattern makes incompatible interfaces work together, without changing them. Only new code which is inserted is in the form of Adapter or Wrapper class. There are two ways to implement Adapter design pattern in Java, one using Inheritance also known as Class Adapter pattern and other is using Composition, better known as Object Adapter pattern. In both cases, it's better to declare client interacting public methods in an interface, you may call it target interface. One advantage of using target interface to wrap client facing method in an Adapter, you create a loosely coupled design, where you can replace your Adapter with better implementation in the later stage of development. Now your Class Adapter pattern extends the original interface, which is incompatible to the client but provides the functionality needed by the client, and it also implements the target interface. Now, Adapter implements target method in such a way that it delegates actual work on original class, which Adapter get access by extending it. Similarly, in the case of Object Adapter pattern, which uses Composition for reusing code, it also implements target interface and uses object of the Original incompatible class to do all of its work. Since It's better to prefer composition over inheritance, I advise that you should stick with Object Adapter pattern. 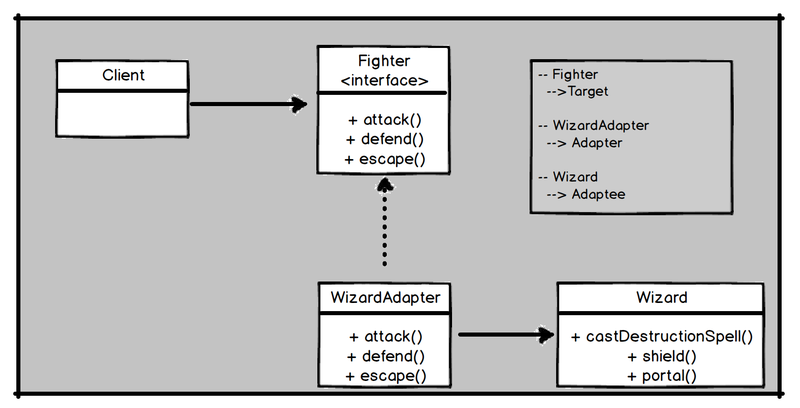 In this example, Client is a target interface and Wizard is the Adaptee. 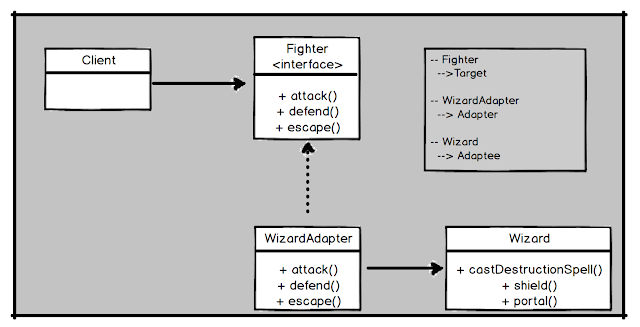 In order to facilitate the use of Wizard, we have created WizardAdapter which implements target interface Fighter but delegates work to Adaptee. Let's see one more example of Adapter pattern in Java. If you remember the java.util.Map has no way to automatically load a two-dimensional array of objects into a Map as key-value pairs. We can create an adapter class that does this. Sometimes the problem you are solving is as simple as "I don't have the interface I want". Two of the patterns in the list of GOF design patterns, Adapter, and Facade pattern solve this problem by providing an alternate interface. Adapter pattern takes whatever interface you have and produce the interface you need. While Facade pattern provides a simpler interface to deal with a number of classes or bundle of resources. * pairs. This Java program creates an adapter class that does this. * implemented in constructor of this class. You can see that our MapAdapter extends AbstractMap to create a Map which can take a two-dimensional array and create a HashMap from that. 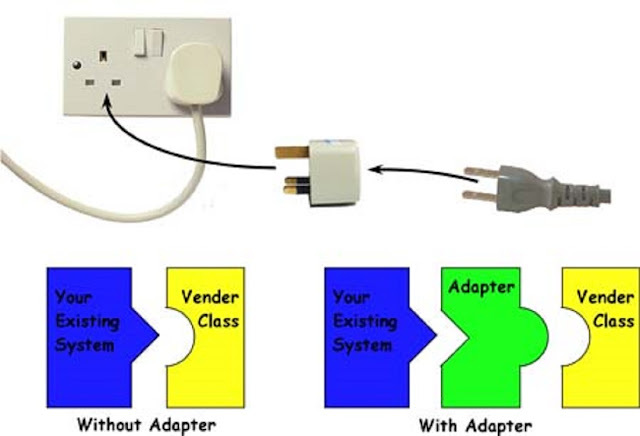 Here is one more interesting diagram which will help you to understand the intent and purpose of Adapter pattern in Java. You can see that your existing system and vendor class doesn't fit initially but when you add an Adapter the puzzle is solved and both systems is able to plugged together. 1) Adapter design pattern ensures code reusability for delegating calls from the client to original class, i.e. it act like a wrapper of original interface, that's why it's also called wrapper pattern or simply a wrapper. This is actually the main benefit of using Adapter pattern. 2) Adapter pattern is a general purpose pattern, much like Singleton, Factory, and Decorator and you will see a lot of examples of Adapter pattern through the code, one of the key benefits of using Adapter pattern in Java is reusing code, making incompatible interfaces work together and loose coupling because Adapter tends to encapsulate incompatible interface quite well. 3) One of the cases where you want to use Adapter design pattern in Java program is while using a third-party library. By making sure, your program uses Adapter, which is in your control, rather than directly using third-party interface and classes, you can anytime replace third-party library, with similar, better performing API. You can count this one of the pros of using Adapter pattern. 4) In the Gang of Four design patterns, Adapter pattern is part of structural design pattern along with Proxy, Facade, and Decorator design pattern. 5) A lot of programmers confuse between Adapter and Decorator design pattern in Java, to some extent they are similar, especially object based adapter pattern but there is a subtle difference between Decorator and Adapter pattern in Java. Adapter just converts one interface to another, without adding additional functionalities, while Decorator adds new functionality into an interface. See here to learn more about the difference between Adapter and Decorator pattern in Java. 6) You can also use Adapter design pattern in Java for conversion classes, e.g. Suppose your client do all calculation in Miles and the library you are using expects Kilometers. In this case, you can write an Adapter class, which takes miles from Client, converts it to Kilometer and leverages external library methods for all calculation. While returning a result, it can convert KM back to miles and send the result to Client. 7) Prefer Object-based Adapter design pattern than Class based, because former uses Composition for code re-use and more flexible than Inheritance based approach of Class based Adapter pattern in Java. That's all on What is Adapter design pattern in Java, How and when to use Adapter pattern and difference between Class and Object based implementation of Adapter design pattern. The adapter is really useful general purpose pattern and Java developers should take advantage of this pattern as much as possible to write flexible code. * converting `com.google.common.base.Converter` to `org.springframework.core.convert.converter.Converter` or vice versa. I think the example is quite similar to Arrays.asList(), the MapAdapter class keep reference of Map and even though author has only define entrySet() method where it delegate function to kept Map reference, he could have define all other Map methods, but nonetheless they are available because MapAdapter class cleverly extends AbstractMap. Though I agree that the examples e.g. Enumeration to Iterator or com.google.common.base.Function and java.util.function.Function better highlight the power of Adapter pattern. well javin few things can be added to get more clear description..
defines domains-specific interface client uses. collaborates with objects conforming to target interface. adapts the interface of adaptee to target interface. Clients call operations on the adapter instance.In turn adapter calls adaptee operations that carry out the request.